The prototype of China’s J-20 fighter made its first publicly witnessed flight on January 11 from Chengdu’s factory airfield. The aircraft, which lifted off at 12:50 p.m. local time and landed 18 minutes later, was accompanied by a two-seat J-10S during its flight. The event was witnessed by high-ranking officials, who arrived from Beijing in two VIP Boeing 737s. Initially the flight was scheduled for January 7, but bad visibility in the Chengdu region forced its cancellation. 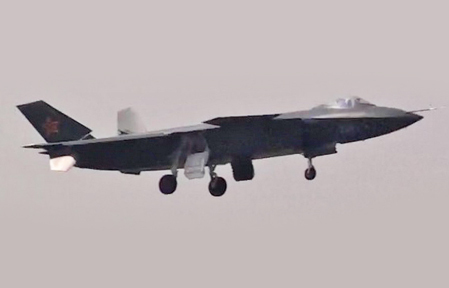 The appearance of the J-20, China’s first stealth fighter, and its first flight has fueled speculation in many areas. How many prototypes have been built? What are its engines? Was this the first flight? Photos leaked online just last week show a single aircraft engaged in taxi trials with two distinct engine nozzle types; unreliable eyewitness reports have said there are two aircraft, but there is no photographic proof of this. Speculation on the engine type has centered on the Saturn AL-31FN and the WS-10G with Honglin FADEC system, with the latter seen as the most likely for the aircraft that made the public first flight. However, the high degree of finish of the aircraft, as well as the fact that the flight was undertaken in front of high-ranking dignitaries and in the full view of the general public, has led to suggestions that another “first flight” might have taken place previously at another, more secret location. It seems likely that the event at Chengdu was timed to coincide with the current visit to Beijing of U.S. Defense Secretary Robert Gates, and the imminent visit to Washington, D.C., by Chinese president Hu Jintao.